Ted Orland is a photographic philosopher extraordinaire. Ted's understanding of artistic choices and aesthetics is unparalleled. Ted has a unique ability to express his insights with clarity, simplicity, and humor. Ted's most lucid and enjoyable enunciation of photographic philosophy is found in his book Scenes of Wonder and Curiosity. For the more esoteric cognoscenti, there is Art and Fear written with David Bayles. Some examples of Orlandisms from Ted's poster "Photographic Truths"
No two light meters agree. Safelights aren't. Available light won't be. On the other hand, gadget bags are. 1/60 at f/8 is the correct exposure for all photographs. 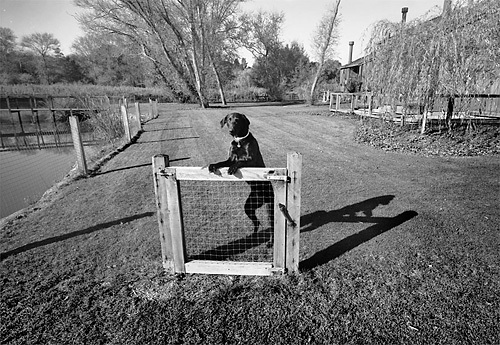 The quintessential Ted Orland photograph is "Gate and Guard Dog," below.